I don't get the part where it says "Clearly a weak wolution $f$ is a proper, i.e., meromorphic function, solution precisely if $f$ is holomorphic on $X_D$". First, I don't get why he says "proper i.e. 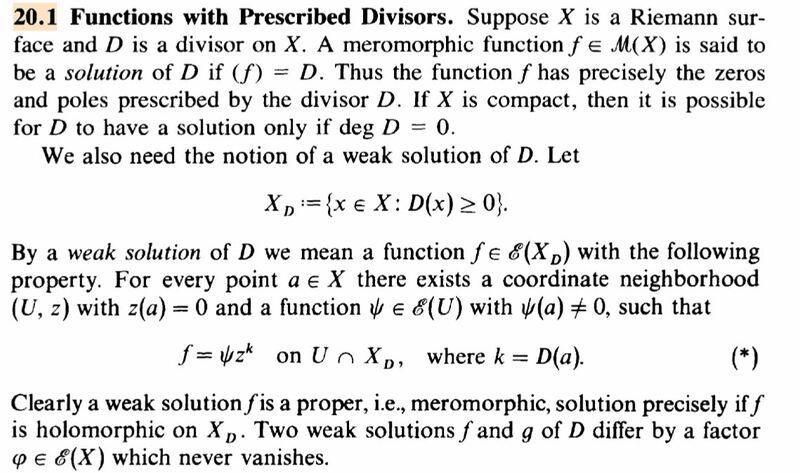 meromorphic", proper and meromorphic functions aren't the same, are they? Also I would say $f$ is then only a solution on $X_D$ not on the whole of $X$. Why is $f$ then a solution on all of $X$? Browse other questions tagged riemann-surfaces divisors-algebraic-geometry meromorphic-functions or ask your own question. Compute the principal divisors of a hyperlelliptic surface. Can a meromorphic function have removable singularities? What is known about the reciprocal $1/f$ of a holomorphic Banach-valued function $f$? Why does a meromorphic function with limit at infinity continue to have limit at infinity when the poles are removed?